Don’t forget to ctrl-f if you’re looking for something in particular. We’ve listed all events in chronological order, categorised into months, for your ease of use. The must-attend event for all senior professionals interested in publishing, content development, social media, digital marketing, innovation, creative and brand content management. A great deal can change within a year. That’s why the Digital Marketing Show are hosting a mid-year pop-up conference at the Institute of Education for those information-hungry digital marketers who cannot wait a whole year between the official Digital Marketing Shows. Formerly SES London, ClickZ Live is one of the biggest internet marketing conferences in the country, based around optimising digital marketing campaigns with search, social and analytics. The conference is designed to help search specialists, digital marketers, agencies and business leaders and brand advertisers, and offers a fantastic networking opportunity for those within the industry. A one-day event focusing on web analytics, where digital analytics practitioners can share ideas and experiences. You can also pay for training workshops with experts in analytics. The biggest gathering of the youth marketing industry in Europe. With 1000 brands, agencies, universities and youth organisations, the 3-day festival is where the future of youth marketing will be decided. Develop a profitable and sustainable media business model for the digital era. At Digital Media Strategies 2016, there are case studies, analysis, workshops, training, round-table discussions and tailored networking opportunity – focusing on key strategic challenges for the media industry in the digital world. Looking to connect with a community of innovators, inventors, leaders, makers and creators of our future? Thinking Digital provides key insights into how technology is shaping our future, and how it impacts your long-term business strategies. SEO Now London is the latest London SEO event, organised by Linkdex. The event will explore customer experience and its importance to digital marketing. Topics discussed with include ownership of the customer experience within your organisation, big data and the customer feedback loop, CX culture and engagement, and upcoming trends that are impacting CX. With more than 220 events in five days across London, Advertising Week Europe is the premier event for marketing, brand, advertising and technology professionals. There will be opportunities to learn and be inspired at seminars and workshops, and network with the very best in the industry. A digital marketing conference in Kent where businesses can learn how to become more digitally competitive and embrace modern marketing concepts. Learn all the latest online marketing technique for SEO, PPC and social media. Quite possibly one of the biggest and most respected SEO conferences in the UK, expecting over 2000 of the UK’s finest search marketers at the Brighton Dome. Plenty of speakers, roundtables and web clinics with the biggest names in the industry. The 10th annual Future of Web Design conference, FOWD 2016 is aimed at web designers, web developers and anyone who is working to make the web awesome. The leading and largest awards ceremony in Performance Marketing, recognising the very best in the industry. The people behind Marketing Week, Econsultancy, Design Week and Creative Review have created the MWL16 marketing event that reflects a business’ biggest opportunities, threats and challenges in this digitally evolving industry. Top names, brands and brains in the biz to inspire you to harness the power of digital, mobile and social and discover the new role of content. Aimed at social media marketers at an intermediate level of expertise, Go Social Go Media is a conference for learning and developing social media marketing skills for business. All attendees will receive a CPD Certificate of attendance, and sessions will cover Facebook, LinkedIn, Twitter, Instagram, Pinterest, content marketing and SEO. Join over 3500 marketing leaders at Adobe Summit 2016, and see for yourself how the digital landscape is changing and what marketers need to do to reinvent themselves and their strategies to succeed. More than 115 sessions in ten tracks to help you get in-depth knowledge in all areas of digital marketing. The International Search Summit London is the ideal event for search marketing and e-commerce professionals who work on global campaigns. International Search Summit London focuses specifically on international and multilingual search marketing, delivered by international marketers for international marketers. The biggest search marketing conference series worldwide, created by Search Engine Land – the leading source of search marketing news. Immerse yourself in two days of SEO and SEM sessions, whether you’re an advanced search marketing veteran or an enthusiastic beginner. There will be plenty of training bootcamps, workshops and networking. Bringing together the leaders in UX. Learn from the influencers who are pushing the industry forward. From Design Strategy, Product Design to Design Practice. An event for marketing leaders with responsibilities over brand and marketing innovation. Leveraging Forrester’s deep research to help marketing professionals to understand and overcome today’s challenges within the industry. Shift is a new campaign and event that is aimed at disruptive marketers, the drivers of digital change. Whether you’re a senior marketer or a digital guru, if you’re responsible for driving marketing strategy then Shift is a game-changing event for you. Uniting the greatest minds in media, Media360 is for those early adopters to learn, create and collaborate through inspiring talks, seminars and surprises. Prepare to welcome the disruption, embrace the chaos and bask in the opportunity, and all by the seaside. For eleven years, Future of Digital Marketing (FODM) has been the number one conference for innovative digital thinkers to discover not just what’s on the horizon, but what can be done about it. The Drum Search Awards recognise and reward the very best in search across both SEO and PPC. SAScon is a Search Analytics & Social conference for digital marketing professionals, now in its seventh year, featuring some of Europe’s leading search and social speakers. A social media and digital marketing event that connects marketers, digital brand managers, agencies and social tools and platforms. The event is a showcase of best practice in social media and digital marketing strategies. The official flagship event of London Technology Week, Interop London is dedicated to the IT and tech community, allowing you to experience global trends and vendor solutions. The world’s first SEO and digital marketing UnConvention is coming to London! UnGagged is a gathering of some of the smartest, forward thinking and courageous SEOs and Digital Marketers on the planet. UnGagged offers platform for free speech and has a no BS, no recording and no pitching policy. Recommended for intermediate to advanced Technopreneurs and SEOs. An annual gathering of leading social media researchers from around the world. In its 7th year, the 2016 conference will be held in the UK. Suddenly everything goes dead for the Summer holidays…. Quite possibly one of the biggest and most respected SEO conferences in the UK, expecting over 2000 of the UK’s finest search marketers at the Brighton Centre – the new venue for the event this September. Plenty of speakers, roundtables and web clinics with the biggest names in the industry. Social Media Week as a whole is an official event, with events happening throughout the world from Miami to Jakarta. Social Media Week London is a week-long conference to help people and businesses understand how to achieve more in a hyper-connected world. Featuring keynotes and panels, workshops, master classes, presentations and networking areas. Premier B2B conference, focusing on sales, marketing, technology and services that power B2B. SiriusDecisions analysts will present the latest cutting-edge research and insights and discuss established best practices. The TFMA event is designed by marketers for marketers. TFMA 2016 focuses on four main themes: keeping up with tech; best practice – optimising tools and tactics; data-driven marketing and the test generation; and talent, progression and culture. If you work within the e-commerce industry, you’re not going to want to miss the eCommerce Expo. Unlike other digital marketing and SEO conferences, eCommerce Expo focuses solely on e-commerce. Get specialist advice on marketing, platforms, payments, delivery and logistics, customer service and other e-commerce strategies. The award-winning festival to celebrate marketing. Past speakers have included Alan Sugar and Chris Hadfield a former astronaut. Gain a fresh perspective on your marking strategy and goals from some of the industry’s biggest power players. Brought to you by Distilled, SearchLove offers two full days of online marketing inspiration as you join some of the world’s leading thinkers in the industry for a conference discussing the latest in search, analytics, content creation, website optimisation, paid promotion and more. You can request an invitation to the exclusive gathering of leaders in digital marketing and digital media, Digital Marketing Innovation Summit 2016 in London. Meet others in the UK digital marketing and media community. Source suppliers and network, benchmark your digital strategies and understand latest trends and technologies. Conversion Rate Optimisation is changing. Discover the latest strategies and tactics. Be inspired by MarTech pioneers and explore the latest trends in marketing technologies and organisations can effectively integrate them into their marketing strategy and operations. The MarTech conference is for those senior-level hybrid professionals who are both marketing-savvy and tech-savvy. The UK Search Awards celebrates the expertise, talent and achievements of the UK’s search industry, and is regarded as the premiere celebration of SEO, PPC and content marketing in the UK. 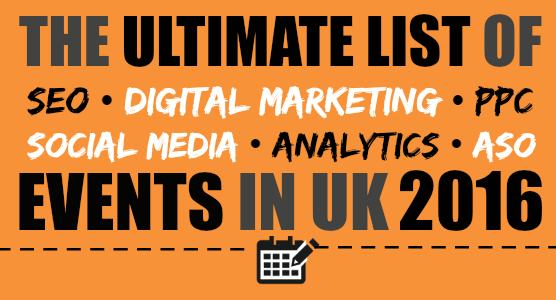 If we’ve left anything out, please let us know in the Comments so that we can add it to our list of SEO events and digital marketing events in 2016! No matter how small the conference or event may be!